I was making dinner tonight around 6:00 and heard a bunch of coyotes howling outside. So what’s new, right? I went out to make sure they weren’t in the yard again and it sounded like they were behind the next door neighbor’s house. I went back to my broiled salmon with rice and broccoli. We have a tradition here that we walk every evening after dinner and we do it in the back yard. It’s a big yard and we have a path we use for our regular 20-minute after-dinner walk. After dinner we were getting ready to head outside when I saw this coyote on the hill behind our house. He was walking past, stopped to stare me down, and kept going. It was time for our walk. We’ve both agreed that we will never use excuses not to walk after dinner and today was not going to be an exception. No excuses. That doesn’t mean no fear. 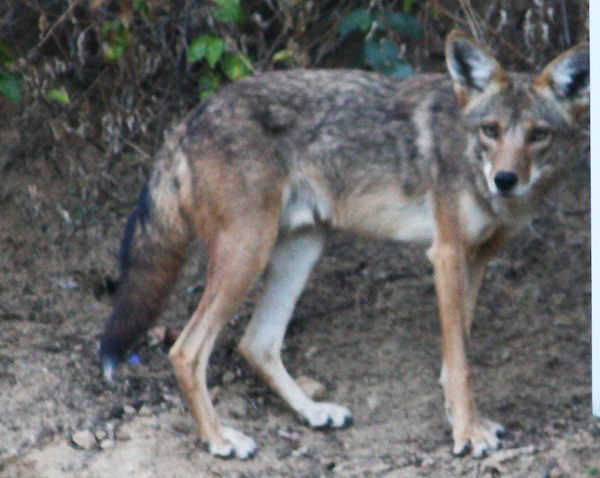 I’m still haunted by the dozen or so coyotes that invaded our back yard a few weeks ago. We needed to feel safe with something that makes noise. The neighbors use an air horn to combat the coyotes but we don’t have one. So Denis got a metal pie pan and a wooden spoon to bang it with. That was okay for one or two coyotes but what if the whole troop comes back? I got my gun. I put it in my pocket just in case and we went walking… with a pie pan, a spoon, and a gun. It’s just life in California.